Thinking about child care? Many parents have to work; they are faced with the decision to put the care of their baby in the hands of someone else. The first year of life is a time when the baby can’t verbally inform you what is going on, so it’s important to choose child care with caregivers that you trust. 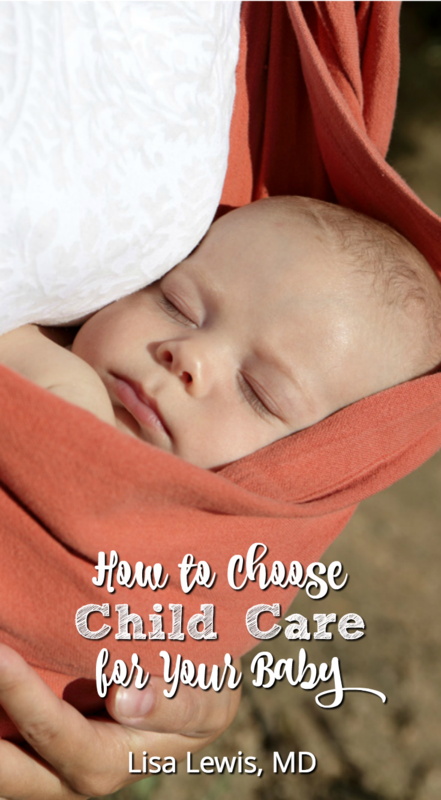 The choices for childcare are typically a nanny, babysitter, family member, or day care. Your family must make a choice that fits your philosophy, financial situation, and schedule. A babysitter or in-home babysitting service may have more than one child at a time. The sitter may be licensed by your state, babysit privately for payment, or even exchange babysitting services (for example, you babysit one day, she babysits the next). Some friends may babysit in exchange for favors. If you are a long-term friend of your sitter, you have the benefit of knowing her potential parenting style and integrity. If she has never babysat or taken care of children before, you may be surprised at her child-rearing practices. For example, a person who is inexperienced may not realize that a baby can choke on any object they put in their mouth. A solo babysitter or nanny takes care of one child at a time or a group of siblings. The benefit of a solo caregiver is one-on-one care for your baby. He will get a lot more attention with a conscientious caregiver. Family members typically have the element of trust, especially if a grandparent, aunt, or uncle is enlisted. This person should be well known to you, and you should understand their style of parenting. The advantages are similar to those of a solo babysitter—individual attention and a lot of nurturing; a disadvantage could be lack of respect for your own parenting style. This is a common complaint with grandparents, who mean well, but have been through parenting themselves and have strong opinions that may clash with your own. A classic example is feeding; you may have one way to introduce solids, and the grandparent may have a totally different idea and doesn’t respect your directions. Often it’s hard for your own parent to see you as anything other than their child, and believe that they know best. If a grandparent is babysitting, a great benefit is the likelihood that he or she will mimic your nurturing style, and give your baby a lot of one-on-one attention. Of course, this is not the case with all grandparents; some feel that a baby needs to fend for himself. As with any babysitter, this will require education and clearly stating your expectations. Writing up a list of expectations is the best way to clearly define your baby’s needs. The price of daycare is typically similar to that of an individual babysitter. There is plenty of supervision at daycare to reduce the risk of accidents or abuse. Babies get more socialized in day care, and a properly licensed day care is generally well trained for the job. Several questions about child care should be asked of a potential nanny, babysitter, family member, or day care. What is your experience with babies? A person who has never taken care of a baby has no experience. Do you want to entrust your baby’s care to that person? A person who has cared for babies (whether her own or someone else’s) is more likely to understand baby behavior. Babysitting a five-year-old is quite different than babysitting an infant. What would you do if my baby were crying? If the answer is: “Let him cry it out,” reconsider or reeducate. The ‘cry it out’ answer is due to lack of education considering your baby’s psychological welfare. There is no research that definitively proves that the ‘cry it out’ method is best for your baby. Of course, it’s not always realistic that a caregiver can get to the baby immediately, but every attempt should be made to console a baby who is crying. Babies are learning to trust the world, and if significant crying is overlooked, they are much more likely to be chronically unhappy. Will you take care of my baby if he is sick? If your child is attending day care, the answer will be “no.” You must have a backup plan for the days when your baby is sick, and if you get a call from day care saying that he is sick, you must be prepared to pick him up. State regulations dictate that sick children must be sent home, so that other children are not affected. Babysitters with no other children are free to care for a sick baby, if they don’t mind potential illness for themselves. If your child is sick and you are able to stay home with him, it may be best for all. A sick babysitter can’t easily care for your child. Babysitters with more than one child typically won’t care for a sick child. If your child goes to the home of another child who is obviously sick, your child is at greater risk of picking up the same illness. Granted, when your child is around other children, he’ll get sick, anyway. That’s part of building up his immune system, which must be done sooner or later. Children who attend day care early are less likely to have asthma later in life. Yes, less asthma is diagnosed in these children. Currently, the reason is felt to be due to a child’s persistent exposure to immune system challenges. So, for those who feel guilty about leaving your baby in day care, know that immune system building is one benefit. Another benefit of day care or a home with other children is exposure to other people. Babies love to look at other babies and children; it’s part of their developmental curiosity. They are very interested in looking at themselves in a mirror, and looking at other children. Babies who are in day care or with a sitter or nanny tend to have less separation anxiety later when they start school. They have built more confidence with separation. What type of routine do you have? If you have no routine, are you willing to create and keep one for the baby? Babies love routine and enjoy the harmony; eat, sleep, play, enjoy. Day cares often are able to provide an easier routine than a babysitter, since they are structured for routine. A good sitter or family member may create a routine, so don’t discount them because it’s easier to get the structure at a day care. Who keeps them honest? Day cares and licensed home day cares usually have to answer to the state. Babysitters, nannies, and family members usually report to you. Good references and reviews are important for all, but when choosing a babysitter or nanny, I suggest obtaining credible references. Is your baby at risk of being physically or emotionally abused? Is your baby high maintenance, chronically ill, or a formerly premature baby? Babies who are born premature, have a chronic medical problem, or cry a lot are more likely to be abused. In a day care with other workers around, if your baby is crying, you generally don’t have to worry about abuse; the workers are accountable. However, a person may be more likely to lose their patience when alone in their home. If you choose a nanny, consider whether you want to use a nanny cam. Do you want to check in frequently? Ensure that you can trust your chosen caregiver to treat your baby with respect. What happens if your babysitter or nanny can’t watch your child one day? If you use a private sitter, nanny, or family member, you must have backup if they get sick, go on vacation, or just can’t watch your child for some reason. In general, day cares don’t close, except for holidays. What type of activities do you provide during the day? You want to ensure that your baby is not sitting in the crib playing on his own during the day. Look at the area where the babies are fed. Ask what happens while they are awake. Look at the toys. The caregiver should speak to and read to your baby. Older babies can engage in many floor activities. They should be encouraged to interact with each other, but not placed with toddlers, who may inadvertently cause injuries. What is the ratio of adults to babies? A day care should have a ratio of no more than 1 to 4 to ensure that your baby gets plenty of nurturing and attention. Higher ratios may not necessarily mean your baby won’t get enough attention; but the lower the ratio, the more time a worker has to spend with your baby. For a day care, what is the staff turnover rate? As your baby gets older, he is more likely to attach to a certain worker. Even very young babies show signs of attachment to those who care for them outside of the home. A person who consistently stays with your baby and knows him well is a plus for your baby’s attachment. If the baby is moved from one person to another, he may become more irritable and feel unsafe. Plus, it takes time to get to know a particular baby and his routine. It’s best to have one or two people that know him well. An additional benefit of day care is meeting other families and networking. It’s nice to know various families for your own personal socialization, and your baby’s enjoyable interaction with other people as he grows.